One of the best ways to appreciate Philadelphia is to take a walk from Society Hill to Rittenhouse Square. It’s a stroll through history that starts near the Delaware River and ends near the Schuylkill River—the original east/west boundaries of the city. In a few hours you can move from the simple red brick homes and structures of the colonial era to the elegant brownstone mansions of the mid-to-late 19th Century. The modern city intrudes, but it won’t break your stride as you track the early development of this city—and the country—through its urban residential architecture. While Center City remained the heart of this area, the city itself grew as the desire for farmland, estates and more space inspired expansion outward beyond the limits of Center City to form the much larger Philadelphia County and the outlying areas to the west, now known as Delaware County, Montgomery County, and Chester County. Philadelphia’s homes were among the first in the colonies. Even as the boundaries of the city pushed outward, its architecture pushed out and up, and evolved with the times. Thanks to the commitment and determination of preservationists, architecture from every era has been restored and discretely updated to accommodate modern owners. Today’s housing market may include original Colonial, Georgian, Gothic and Victorian homes or properties inspired by those styles as well as new construction, including modern living spaces with open floor plans. Living in the city provides easy access to the many world-renowned museums—large and small—located in Center City Philadelphia. The Avenue of the Arts on North Broad Street is just one venue for theater, dance, and music in town. And then there are the universities and colleges that attract students and scholars from every continent on the globe. Several of Philadelphia’s hospitals and research facilities are considered centers of health care excellence. The Philadelphia Stock Exchange and the local offices of Fortune 500 corporations connect the area to global markets. The other important Philadelphia feature with a global flavor—literally—is its restaurants. From one room, bring-your-own wine (BYO) neighborhood haunts to elegant culinary temples that feature haut cuisine and extensive wine lists, Philadelphia offers an inexhaustible selection of dining experiences. 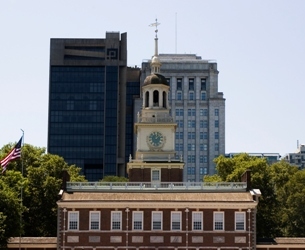 Philadelphia is an American historical mecca and a modern, cosmopolitan city. If you like urban energy punctuated with town squares, parks, and a tree-lined boulevard that enhances a variety of real estate and lifestyle options, then, Center City Philadelphia could be the city you call home. I am a Philadelphian and I genuinely enjoy this city. I’d be very happy to give you the insider’s tour of this multifaceted town. With over 25 years experience matching buyers and sellers in and around Center City Philadelphia, I can assure you it would be time well spent. Call me at 610.608.6886 or email me today.